Here are 5 budget-friendly vintage luggage's that scream style, functionality and convenience for the frequent traveler. A luggage can say a lot about your style and your personality while you travel. So, why fit in when you can stand out everywhere you go? Vintage luggage’s are definitely statement pieces because they’re unique compared to the average looking sets out there. Since you’d be out and about, you definitely need something that screams style and convenience all at the same time. Don’t you love that feeling you get knowing you’d be the only one rocking a great vintage luggage? It gives you confidence and definitely sets you apart from bumping into someone with the same luggage. The luggage that you choose to travel with can also improve your overall experience of your trip. You don’t have to worry about the luggage been bulky or heavy…and more importantly, you get t o enjoy comfort and ease while on the move. I took some hours to carefully review different luggage’s that are both popular, durable and high quality for you. Each luggage chosen is stunningly designed and has different colors and designs to match your own unique taste. When considering which vintage luggage you’d love to own, having the following criteria ticked will ensure you’re happy and can get your money’s worth as well. Love to travel in style? This gorgeous suitcase is not only unique to the eye, but it’s convenient for frequent traveling. It comes in 8 colors and has multi-directional 360 degree wheels to help with maneuverability. You don’t have to worry about dragging a suitcase along with you, and the side handle is designed to help you lift the luggage easily. Did I mention that it’s lightweight as well? If being stylish and having an easy-to-use luggage are some important criteria for you, then consider this beautiful suitcase. It not only comes in 8 unique colors, but the waterproof leather exterior definitely sets this luggage apart. Fortunately, you don’t have to worry about having a broken suitcase anytime soon. Steve Madden has been around for many years, and one of their greatest strengths is creating and designing high quality products. It has ergonomic handles to help you while you push the luggage as well as 360 degree rotating wheels to help with gliding. It comes in 3 beautiful colors to choose from. The set doesn’t come with TSA locks, and you’d have to pay extra depending on the color you’d prefer either than purple. If you’re brand conscious and would love to rock a Steve Madden set, then this would match your fancy. The design of each bag is beautiful and you have different colors to choose from. The wheels also make for an efficient traveling experience and the interior pockets help you in organizing all your important contents. This carefully designed suitcase is an amazing addition to your travel essentials. It’s not only beautiful to look at, but the interior is also well done – red to be exact. The suitcase is made from 100% Virgin Makrolon polycarbonate which is created to withstand different temperatures and resistance-friendly. I personally love that this suitcase has a braking system which gives you the option of locking the two front wheels to avoid it spinning away. Now, isn’t that impressive? The bag doesn’t have the ability to expand to create more space. This is perfect if you’re looking for an eye-catching luggage case that keeps your convenience in mind. With the two different compartments, you have the ability to pack contents that won’t shift and mix together. Durability is also another great value you get from this luggage considering you don’t have to worry about the luggage wearing and tearing. This set which comes with a trolley suitcase and hand bag comes in 3 different colors to choose from, and the stitching is handcrafted. I love that the set is lightweight which is important when it comes to comfort and mobility while traveling. There are 4 spinner wheels that comes with the trolley suitcase. The interior is beautiful with blue stripes and a mesh pocket to store all your items. This luggage set doesn’t have the ability to expand if you’d like to add in more items. 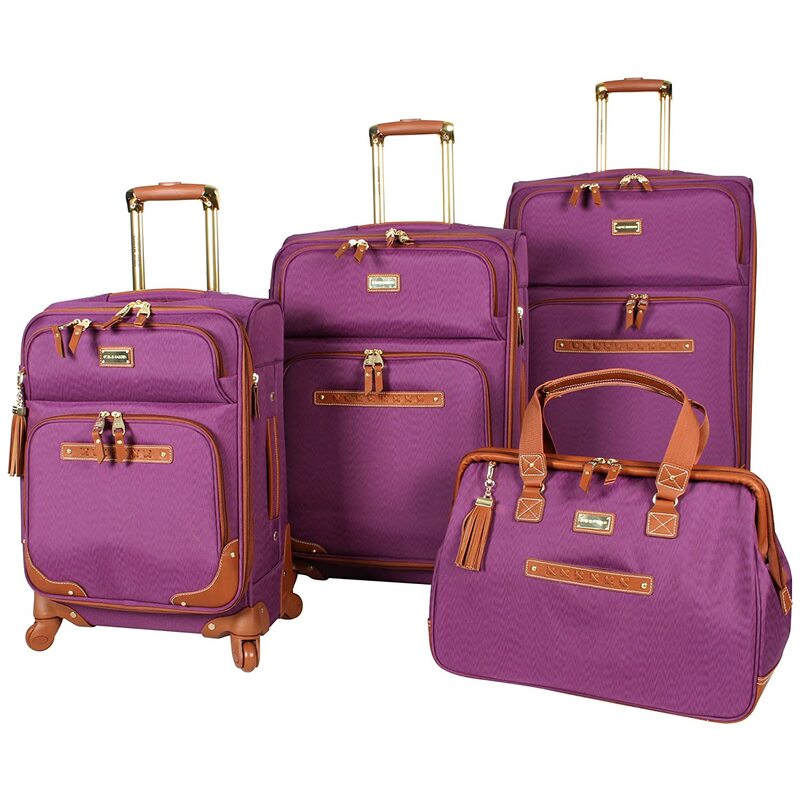 Great for long and short trips, this luggage set is an eye-catcher and makes for a comfortable traveling experience. If you’re looking for an affordable set that comes in different colors, has TSA locks and easy-gliding wheels, then this might just be it. This feminine styled luggage is great for different travel occasions. Whether it’s a girl’s trip or even an international adventure, you can take this luggage along with you. It’s floral exterior definitely makes it stand out from regular luggage’s. Also, the luggage has polyester lining as well as a TSA locking system to protect all your belongings. The spinning wheels is a great convenience to an already great luggage. The luggage is a little bigger than the average carry-on bag. If you don’t want to carry a large luggage with you on short trips with friends, this floral luggage is convenient for such an occasion. The exterior is pu leather and partially waterproof which is great for maintenance. 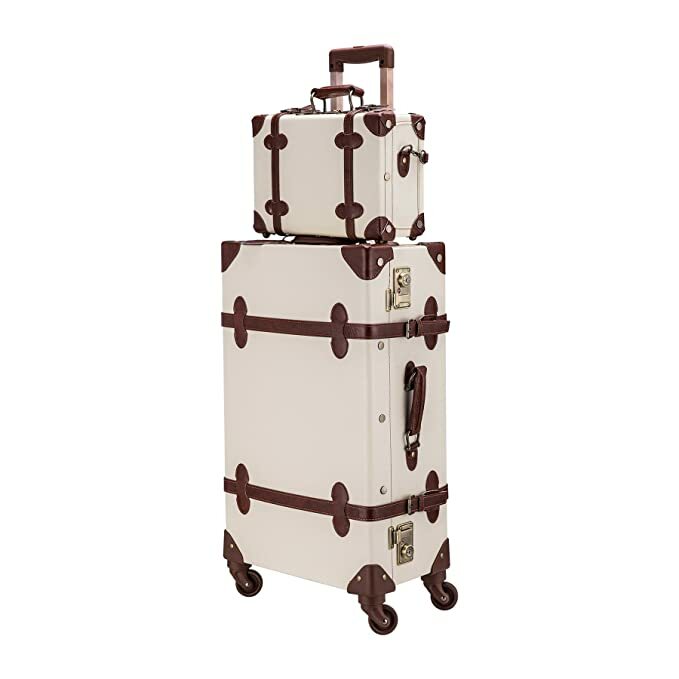 I personally love the rose gold accents on the luggage which makes it vintage yet modern. The Unitravel Vintage Lightweight Luggage is for the stylish traveler and with its different features such as the TSA lock system and multi-directional wheels, it’s convenient while you’re on the go. It’s also lightweight which makes lifting and maneuvering about easier and more comfortable. 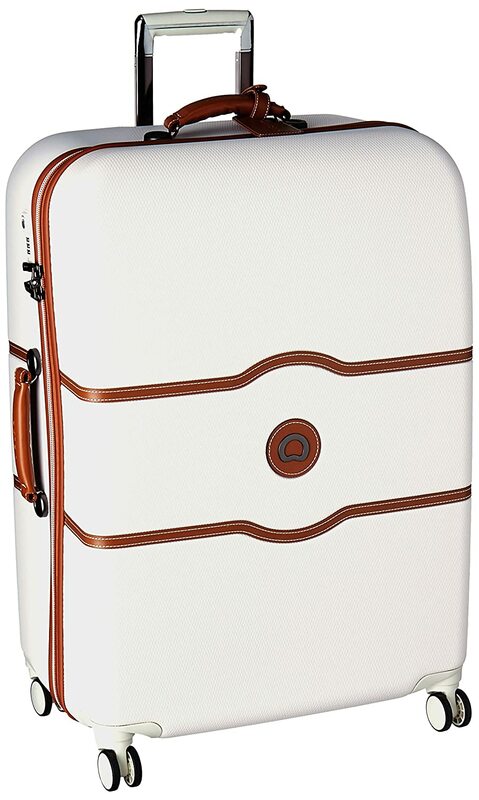 This Delsey Luggage Chatelet Spinner Suitcase screams durability. It’s carefully crafted with a brake system which is such a convenient way from having to manually hold your luggage to stop it from moving. The material it’s made from is also durable and resistant for any travel experience you hop on. If you’d like to invest in a vintage set that keeps your comfort in mind, then the CO-Z Premium Vintage Set is perfect for you. It has a TSA lock system and a hand bag that you can use to pack valuable items in. The design is also unique and comes in various colors you can choose from. The Steve Madden 4 Piece Set is not only gorgeous, but it’s a fashion statement while you travel. I personally love the set because it’s able to expand which is a great feature considering days will come where you would want to pack more than usual. Having that option is great. Lastly, the UNIWALKER floral luggage bag is far from basic. 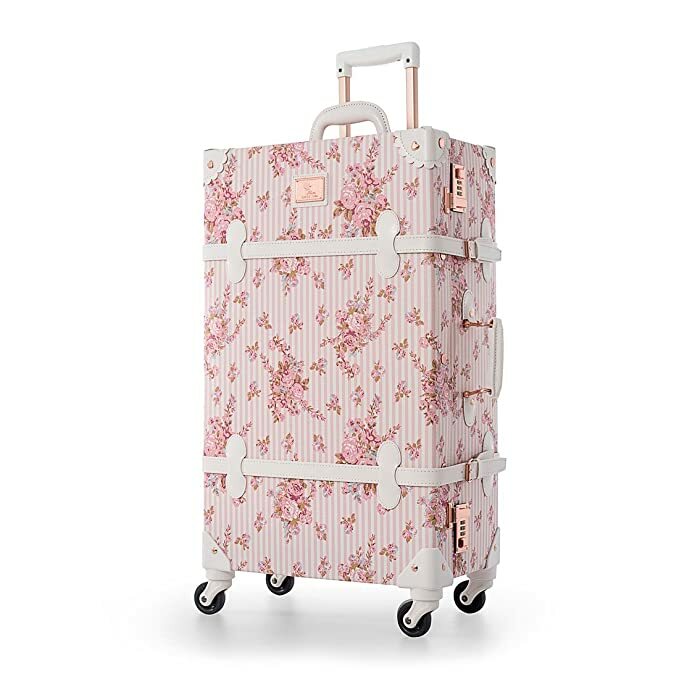 With its eye-catching floral design, you would confidently take the luggage along with you wherever you may go. It’s also lightweight and has a rose gold touch that makes it a vintage piece but with a hint of modern as well. Hi, there! My name is Rachel and I recently decided to travel more and explore the world outside of everyday life. Besides traveling, I love to film and write which helps me keep a balance. The Stylish Travel is all about traveling on a budget, sharing experiences and finding the best destination spots. Here's to more exploring, and fun adventures! Want to stay in touch with us? Subscribe to never miss out on a thing.